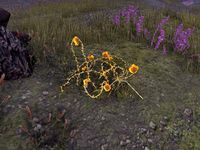 Dragonthorn is a fairly small thorny bush with bright yellow flowers sprouting across its long tangled stem, which when picked can be used as an Alchemy Reagent. It can be found growing in all zones, with the exception of Coldharbour (outside of the Hollow City). Like the other non-mushroom plants, it tends to grow out in the open. This chart lists only combinations in which two or more of Dragonthorn's effects are present. This page was last modified on 3 February 2019, at 08:54.